Compare Permanent Hair Removal Devices: Silk'n Flash&Go, Remington iLIGHT Pro or Tria Beauty Laser 4X? Imagine never having to pay for another razor refill or painful waxing treatment to keep your skin beautiful! Imagine never having irritation, little black dots or hair that seem to grow back soon after shaving or waxing! Imagine never having to pay for expensive laser treatments to professionals to avoid these problems! Well, all that is indeed possible nowadays using home based and FDA approved IPL/Laser based permanent hair removal devices which after a small number of treatments can produce permanent hair removal results. And this, for a fraction of the price you would pay to cosmetic and medical professionals. IPL (Intense Pulsed Light) and Laser are technologies used to perform various skin treatments for aesthetic and therapeutic purposes, including hair removal. The main difference between IPL and Laser technology is that with Laser systems a specific wavelength of light (around 810nm) and pulse duration is used to obtain optimal effect on a targeted tissue with minimal effect on surrounding tissue, while with IPL systems a range of wavelengths, typically between 400nm and 1200nm, are used. ​With IPL systems, to protect the skin, unwanted rays are safely filtered out, so that only light within the desired treatment range is allowed to pass through. With Laser systems, this is not required since only a specific wavelength of light is used. IPL/Laser technology based energy, generated and applied to the skin by a handheld device, penetrates the skin, targets the melanin or pigment in hair follicles, gently heating them and disrupting the growth cycle, disabling hair growth at the root without damaging the overlying skin and the surrounding tissue. People with dark skin tones have a higher risk of skin injury from IPL/Laser based treatments, because of higher levels of melanin in the skin, melanin being the pigment that gives color to skin and hair. For additional safety, some devices have a built-in smart sensor that detects if skin tone is too dark for treatment and will not pulse if the skin has too much pigment. Using IPL/Laser treatments on tattoos or dark spots can injure the skin. Treatments work best on darker hair types or hair that contains more melanin and therefore can absorb more energy. Black and dark brown hairs respond the best, although brown and light brown hairs will also respond, but typically require more treatments. Lighter hair colors such as naturally white, blonde, red, or gray will not absorb enough of the light pulse based energy to disable the hair follicle, and therefore, in general, will not respond as well to treatments. These systems are designed for use on legs, arms, underarms, bikini line and other areas of the body where hair removal is desired. Some are not supposed to be used for facial hair removal, but others, such as Tria Laser 4X, Silk'n Flash&Go and certain models of Remington iLIGHT, can be used for facial hair treatments as well. Even though these products do not require to wear some sort of eye protection (like goggles) when the face is treated, if you consider that when you go to a professional they usually make you wear goggles, it makes sense to protect your eyes during home treatments of the face as well. Finally, you should read very carefully the instructions and warnings that come with these devices to avoid errors that could cause injury. This article will compare permanent hair removal devices Silk'n Flash&Go, Remington iLIGHT Pro and Tria Beauty Laser 4X. These were not just the most popular among Amazon customers at the time this article was written, but they had also received good reviews from most Amazon customers who have used them. Selected Permanent Hair Removal Devices on Amazon. Most permanent hair removal systems nowadays use either some form of IPL or Laser based technology described above. Silk'n Flash&Go comes with a cartridge that is loaded with 5000 pulses of hair removal energy which yield professional-quality results. Note that the cartridge’s predetermined number of "flashes" is what decides the life of the product as sold. Though Silk’n Flah&Go is loaded with a cartridge that supports 5000 flashes, replacement cartridges exists. Silk'n Flash&Go has 5 application intensity settings corresponding to 5 intensity levels. 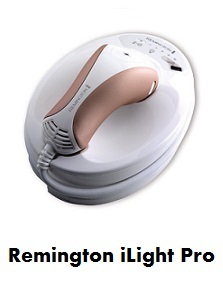 Remington iLIGHT Pro’s ProPulse technology is similar to the IPL technology used by dermatologists. It generates light pulses that effectively targets hair follicles to disable growth by putting out energy at optimal power levels. iLIGHT Pro uses a 1500 flash glass bulb. The company claims that after just a few treatments you can see results that last 6 months, and that after the initial treatment regimen, iLIGHT Pro should be used only as needed. It has 5 application intensity settings corresponding to 5 intensity levels. Tria Beauty Laser 4X uses professional-strength laser hair removal technology and the company claims that it can deliver 70% hair reduction within 3 months. It targets the pigment in your hair and permanently disables the hair follicle's ability to regrow hair. Tria Laser 4X has a buil-in battery and is designed to last for about 300-400 charges (equivalent to about 90,000 pulses which should be enough for a very long time). There are no replacement bulbs, cartridges or batteries, so you must purchase another unit if you require treatment beyond 400 charges. It comes with advanced features like faster treatment times, a digital display and a pulse counter to make sure you get the best possible results. It has 5 application intensity settings corresponding to 5 intensity levels. Remington specifies that iLIGHT systems should not be used anywhere on or around the face, head, ears or neck. In particular, do not use the iLIGHT Pro on or around the eyes, eyebrows or eyelashes. 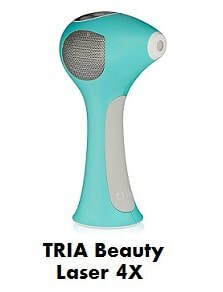 According to the manufacturer, Tria Beauty Laser 4X can be used from head-to-toe to produce permanent results and laser-smooth skin, and Amazon customers have reported that they used it successfully on their face. ​For additional safety, all three brands and all models reviewed here have a built-in smart sensor that detects if skin tone is too dark for treatment and will not pulse if the skin has too much pigment. Only Tria is equipped with a digital user-interface window which guides you through treatments and helps troubleshoot errors. You can view on the window the 5-comfort settings of the device, battery charge status, a skin sensor indicator and the lock status of your device. It also features a pulse counter, allowing you to track the number of pulses administered within any single treatment area to target the optimum number of pulses and ensure complete coverage accuracy. Silk'n and Remington systems do not require any batteries. They are corded and to use them, you simply plug them in. Note that it is the life of the cartridge (or bulb) that's within these devices that determines their life. More precisely, it is the cartridge's predetermined number of "flashes" that decides the life of the product. What you will have to change after a while is the cartridge (or bulb), unless you are using a "lifetime" cartridge that is available for Silk'n. Tria Laser 4X is cordless and has a built-in battery that is designed to last for about 300-400 charges (equivalent to about 90,000 pulses). There are no replacement batteries, bulbs or cartridges, so you must purchase another unit if you require treatment beyond 400 charges. The battery charger is included in the purchase. For exact prices on these hair removal devices, please refer to the Amazon products section below. Note that the Amazon price often includes a generous discount to the list price. If a discount exists, both the Amazon price and the list price will be displayed when you click the Amazon product link images below. So, which of these permanent hair removal systems should you get? The above table shows that most reviewers have been satisfied with these products and gave either 5 star or 4 star ratings. Even though there are fewer reviewers who gave lower ratings (3 star, 2 star and 1 star), their number is not negligible, and it illustrates well that IPL/Laser based hair removal systems do not work as desired on everyone, even if they work on most people with darker hair and lighter skin. The manufacturer claims that with just two to four self-treatment sessions, most users experience visually diminished hair that is comparable to results produced by professionally administered laser procedures, and that 80% of users experienced a noticeable reduction in hair after 3 months while 90% preferred using HPL to visiting a spa or salon. The manufacturer claims that after just three treatments you can see results that last 6 months, and that in clinical testing, on average, participants had 48% less hair 6 months after just 3 treatments, similar to results observed from professional hair removal devices. The manufacturer claims that Tria Laser 4X is supposed to deliver 70% hair reduction within 3 months, with one treatment applied every 2 weeks. On a study done on test subjects, it was also found that any hair that did regrow was less noticeable and finer. Of the 13 test subjects, 100% reported satisfaction with the results. Do you prefer IPL or Laser technology? There is an ongoing discussion regarding which technology produces better results, and people being all different, some will observe satisfactory results with IPL, while others will prefer Laser. At the end of the day, it all depends on the type of skin and the type of hair that you have. Note however, that Laser systems can be more effective for permanent hair reduction as they use a single wavelength that can create more heat and more focused light energy that is directly concentrated on the hair follicle, yielding better and longer lasting results with less chance for any side effects since compared with IPL which uses a range of wavelengths, there is less heat being absorbed by the tissue surrounding the follicle. So, if you prefer Laser technology, you should go for the Tria Laser 4X as the other two brands considered here use IPL technology. If you want to treat your face as well, you should choose the Tria Laser 4X or Silk'n Fash&Go systems, as it is not recommended using the above compared Remington iLIGHT Pro system for the face (for another Remington system system that can be used for both the face and body, the Remington iLIGHT Ultra, please see the Amazon section below). Finally, for the longest warranty you should consider the Remington iLIGHT Pro system which comes with a 2-year warranty as opposed to 1-year for the other two brands considered here. Please click the permanant hair removal device​ of your choice below for price information or to purchase. Note: As mentioned above, it is not recommended to use the above compared two Remington iLIGHT system for the face. For a Remington iLIGHT system that can be used for both the face and body, you might want to consider the Remington iLIGHT Ultra which is FDA cleared for use on body and female facial hairs. It can achieve up to 94% hair reduction in just 3 treatments and it supports 65000 flashes.